Ibsen agreed with the common view in the 19th century that men and women were different, however, he took this further and suggests that they have different consciences. Ibsen believes women may think of something as right where as men may view the same view as wrong. Ibsen attributes this to the lack of understanding between the two genders, which is shown in A Dolls House as Dr Rank and Helmer are unsure as to why Nora is acting so boldly, so Rank wonders if she is pregnant due to the lack of understanding about women at the time. 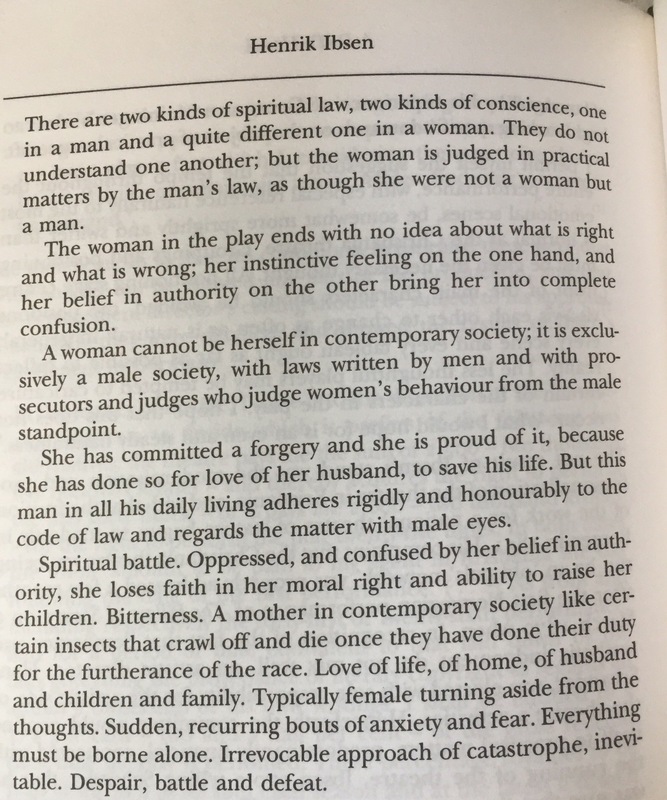 Ibsen goes on to stress the idea that women have no chance in the male dominant society, and they are better conforming to their typical role of a house wife. I agree with the link between Nora and a certain insect crawling off to die after it fulfills it’s purpose. Nora’s purpose in society was to give Helmer children, which she has done, but there is no doubt she will not survive in the cold outside world.